Weighty Matters: Ads Inside your Children's Schoolbuses? If you live in South Carolina, that horrifying headline is about to come true. 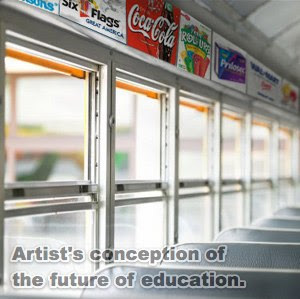 According to Brandweek, the caring folks that make up the South Carolina Department of Education have sold out your children by allowing advertisers to pay school districts $2,100 per month per bus for an 11 inch strip of advertising above their school buses' windows. Clicking here will take you to a form to send Jim Rex, the elected Superintendent of Education in South Carolina, an email. Does everything always come down to money?